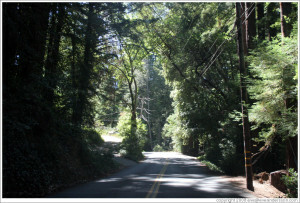 An enduring, rustic 15 mile climb up the Santa Cruz mountains has me eager and full of joy. 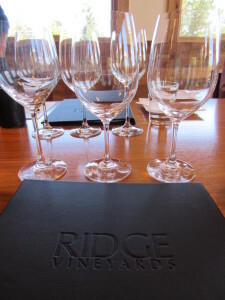 We make our ascent with our first destination being Ridge Vineyards. The destination just may take your breath away. 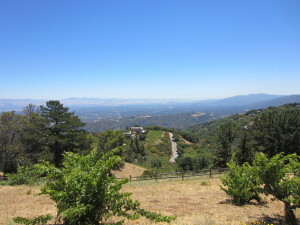 Upon arriving, I almost stumble clumsily because I’m too busy looking down at Silicon Valley below (see images in slideshow above). It doesn’t take me long to notice the “beware of rattlesnakes” sign either. Yup, this is upscale rustic at its finest. I’m happily realizing that I’m thankful for visiting this place during the week (reservations only) rather than a normal weekend tasting where tours and intimate tastings are non-existent. Although the place is astonishing, they don’t offer weddings or evening events because getting back down the mountain after a few glasses of wine, plus the added obstacle of darkness (complete darkness – no street lights on this mountain) makes the trek down nearly impossible to the Santa Cruz novice. We venture off to begin the tour. 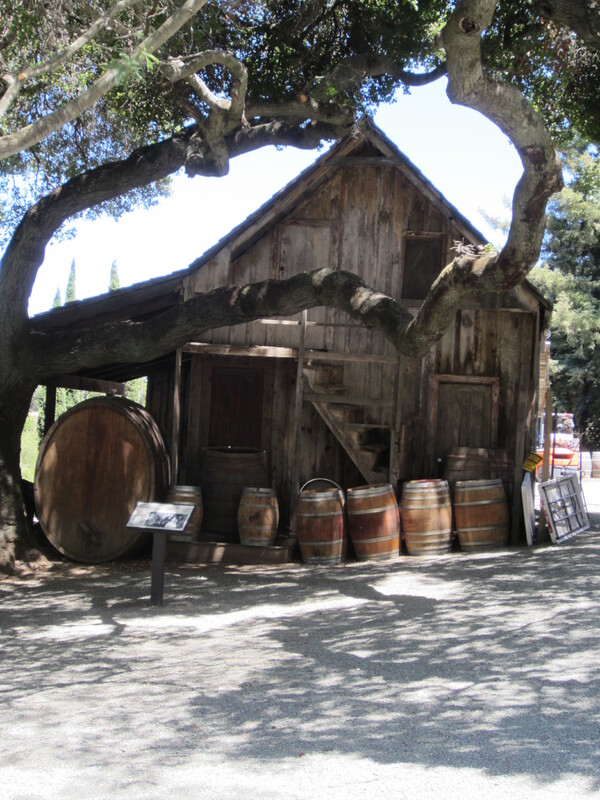 We start in the original barn where the winemakers made the first batches of Ridge. 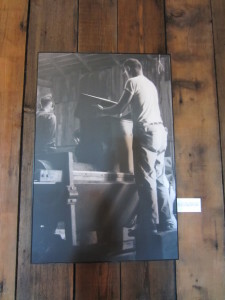 You can see photos here of the labor and love. We then make our way to the tasting room where we are greeted with a leather bound tasting menu, crystal stemware, and a lovely cheese platter. We start with the 2011 Jimsomare Chardonnay ($32) from the Monte Bello Vineyard (Santa Cruz Mountains). A delightful Chardonnay with great balance of fruit and oak. Only 16 barrels were produced (each barrel holds 300 bottles). The fruit for this wine was handpicked and carefully sorted. The winemakers here only use the natural yeasts in the grapes (instead of manufactured yeasts). Next, we tasted the 2011 East Bench Zinfandel ($28) from Dry Creek Valley. The grapes are from a 12 year old vineyard, and aged in American Oak for 13 months. This wine had excellent notes of black pepper, spice and black fruits. 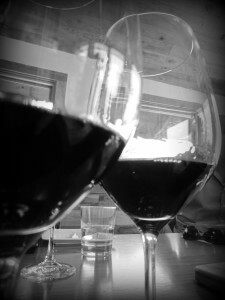 We progressed onto the 2010 Ridge Estate Merlot from Monte Bello (Santa Cruz Mountains). The very first Ridge Estate Merlot was created in 1974. For this vintage, the grapes underwent primary and secondary (malolactic) fermentation and saw 20 whole months in American Oak Barrels. This wine was supple and balanced with notes of jam and subtle tannins for structure. Now onto two great Cabernet Sauvignons, and the great blending artwork that defines Paul Draper’s winemaking genius. We started with the 2010 Ridge Estate Cabernet Sauvignon ($45) (Santa Cruz Mountains) (80% Cabernet Sauvignon, 17% Merlot, 2% Petit Verdot, 1% Cabernet Franc). 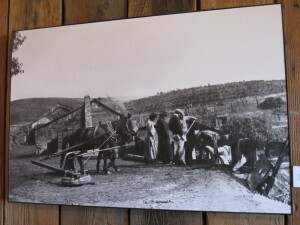 The grapes were hand harvested and fermented on the native yeasts. For this vintage there was an unusually cool summer, causing slowed growth. The crop was thinned substainally in an effort to insure full ripeness. This wine provides a palate explosion of great tannic structure with hints of tobacco, cassis, and black fruit. It can be enjoyed now, and will develop fully over the next decade. Last, but not least, we venture onto the 2007 Ridge Monte Bello ($160) (Santa Cruz Mountains) (79% Cabernet Sauvignon, 10% Merlot, 9% Petit Verdot, 2% Cabernet Franc). A wine meant for aging (lay down for up to two decades), this wine provides classic Monte Bello nuances of dark fruit, firm tannins and lively acidity. 2007 was an excellent vintage year and this wine is definitely a treasure. This is one of the wines (not this vintage, but the regional varieties) that entered the re-inactment of the Judgement of Paris in 2006. We then took our Monte Bello vino as we strolled through the vines, comparing varietals and ages of the vines. 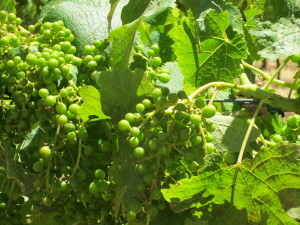 It’s June so the grapes are small and green, with veraison happening soon. Here, the workers live on the mountain and are on the land each and everyday. Although they use technology in the vineyard – the meters to read the humidity within the vines, the workers are so intimately involved with the grapes, that they are the first to notice a change, or complication. We end our visit with a kodak moments on the ridge with great views of the towns below. 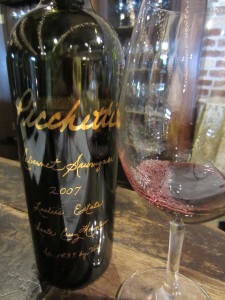 As we venture back down the mountain, we make a stop at Picchetti Winery. Upon arrival, we are greeted by a rooster walking the grounds and a vintage farmhouse. This place does not distribute their wines, and most wines I tasted were quite delightful and worthy of purchase. I started with a Viognier, and although pleasant, I can say with confidence that the Pedernales Viognier still takes home the cake. Although the Pichetti Viognier had a nice floral nose, the components fell flat on the palate. I also tasted a Pinot Noir that packs a punch at 14.4% ABV. I will admit this is the best New World Pinot I have tasted in a LONG time. (Disclaimer, I’m partial to old world Pinot Noirs). This one had great old world characteristics with gamey, earthy tones. A nice balance of flavors and a long finish. 2007 was a stellar vintage year for CA. Upon tasting the Cabernet Sauvignon, I was wisped away to palate heaven. This wine is certainly a representation of what the Monte Bello terrior can create. That was a wrap for our quick adventures to the vineyards of Santa Cruz. It was well worth the trip and a region more delightful than other areas in California. Although I won’t make direct references, I will admit, I cringe at any tourist trap when I travel, so I was delighted to partake in tastings at places that are only open a couple of days a week or via reservation only. Plus, the tasting fees weren’t astronomical. It was a joy to partake in a mountainside adventure paired with great wines. Previous Previous post: Gruner Vetliner Anyone? Next Next post: Wineless Wine Tasting?